Hiking up a mountain for the first time does something to you. It changes you in ways that are hard to describe. Faced with so much overwhelming beauty on a scale that is hard to image, you can’t help but be affected. So when you descend, it’s almost like you are a different person—somehow more than when you began your climb. Last year I had the opportunity to hike up a mountain in the Swiss Alps near Lauenen, Switzerland. It was truly an amazing experience made even more special by my companions who accompanied me, one of whom has been a guide to me both hiking up mountains and in life. I decided I wanted to try and capture this unique experience and put it to music. The first challenge, of course, was: how do mountains “sound?” I began collecting different pieces of music that seemed to reflect the feelings of my climb and represented the grandeur and majesty that are the Swiss Alps. Artists like Hammock, Deepspace, Jeff Pearce and Manual fit very well. Then I happened upon a documentary on Philip Glass on public TV. Several Glass pieces I thought perfectly captured the rhythm of Wandern—German for hiking—as did a piece by Parks. Other artists like Mark Isham, Bass Communion and Sigur Rós I thought captured well the feeling of finally reaching the top and seeing the amazing view—surrounded by peaks as far as you can see. Finally, I found other pieces representing the descent and end of the journey. Because the mix represents points along a journey I decided to label the different parts of that journey as “movements” which I have listed below along with the timecode where each movement begins. I also was able to incorporate a number of field recordings of wind, mountain streams and even cowbells in the mix. You’d be amazed at how many cows are climbing around the Alps! 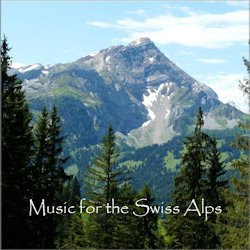 So, with that I present to you Music for the Swiss Alps. This mix can’t possibly do justice to the beauty of the Swiss Alps. You will have to go and visit yourself to see what I mean. I would like to dedicate this mix to all of my friends in Switzerland but especially to my mountain guide and great friend who has taught me a lot about the Zen of Wandern and about myself. I will be returning to Switzerland soon to go Wandern again. I almost feel like I am returning home—to climb other mountains and find new paths to try and touch the sky. 11. Manual with Jess Kahr - Dawn Changes Everything.